We have updated our Help Docs to reflect the changes. WordPress 3.3 has streamlined file upload. Instead of needing to click on a specific icon based on the type of file you are uploading, there is just one. Once your file is uploaded, the appropriate fields will be displayed for entering information based on the file type. To save space and increase efficiency, the admin bar and the old Dashboard header have been combined into one persistent toolbar. Hovering over the toolbar items will reveal submenus when available for quick access. 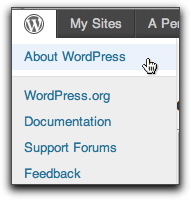 When new features are added, navigation has moved, or other dashboard changes that might throw you for a loop, WordPress will let you know about it with new feature pointers explaining the change. The dashboard home screen will have a Welcome area that displays when a new WordPress site is accessed for the first time, prompting the site owner to complete various setup tasks. Once dismissed, this welcome can be accessed via the dashboard home screen options tab.